My apartment bathroom redo is now complete. Yes, I rent this apartment, but I consider it an investment in both my future and my peace of mind to have a bathroom that I love. There is no point in living with rooms that you hate if you can make improvements on a budget. If you don’t like your bathroom, it doesn’t hurt to ask management if you can pay yourself to update it a bit. I like having a higher vanity because I don’t have to stoop over now when I brush my teeth. It is at the right height for me. This is my only bathroom, so it was important to me to make changes so that I could be happier with it. I like to use baskets for storage. They are perfect to store and corral small items and add texture to your room. It also makes it much easier to clean the vanity top. I’m not as happy with my paint job. I wish I’d used matte paint instead of semi gloss. But I can redo that another day. As far as I’m concerned, it is done. Maybe spotty in places, but good enough. I didn’t realize how the sheen of the paint would look in a room with no window. Lesson learned. I chose more of a cottage style for this bathroom. 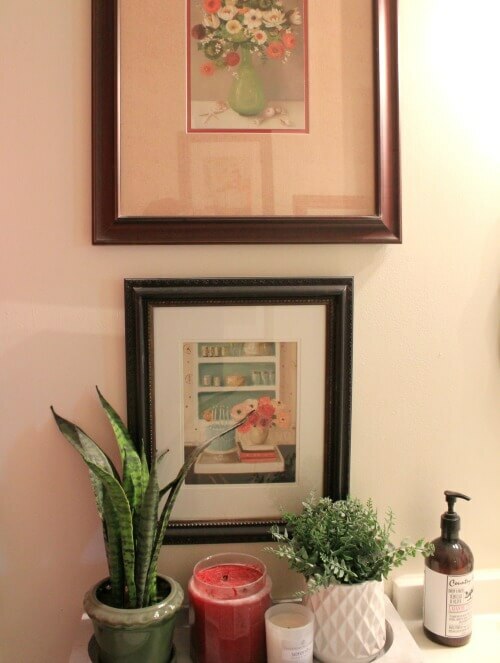 I hung all of my Janet Hill paintings, which I love, in this small space. I have never seen one of her paintings that I did not immediately fall in love with. I brought in my light blue tool caddy to hold candles, etc. It is a versatile piece that I’ve used all over my apartment. I would rather have decor in a container I can lift up to clean rather than dust around a lot of littles. I paid the maintenance man $130 to install all of these things, and I did the painting. I consider this a modest low-cost redo. Total cost was just under $600. What was important to me was to get rid of the outdated vanity, sink and lights. I had a new taller toilet and a hand-held shower nozzle installed before I moved in. They did not charge me to install those items. 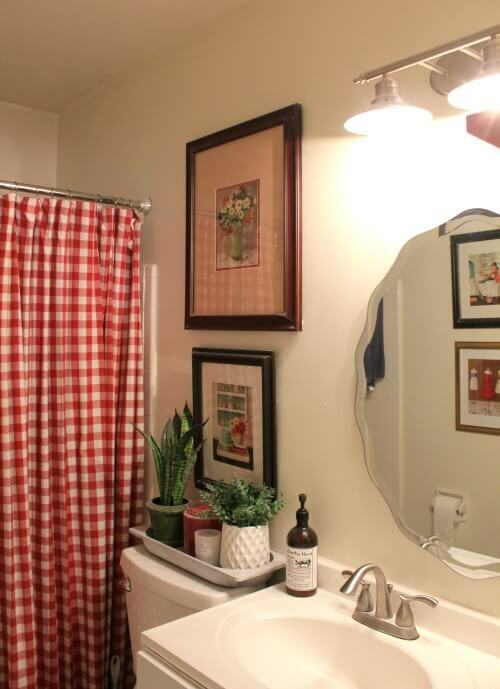 I added the red and white gingham shower curtain a few years ago, and I have not grown tired of it. I love not having that long generic apartment mirror that was literally glued on. The maintenance man had to rip it off, but it didn’t do any damage to the walls, thank goodness. I much prefer this smaller mirror that I found at such a great price at an antique mall. I didn’t have to add these things; I chose to. I’ve lived here for three (updated: now four) years and probably will live here many more. My advice to you is this: Please don’t postpone life, telling yourself, “one day I’ll have a better bathroom.” Or whatever your dreams may be. It’s important to be happy in the now. Do what you can afford to do to be more content with your space. You don’t have to go into debt to update a bathroom if you do it wisely. I love what you've done to your bathroom to give it a fresh new look, Brenda! I don't like a lot of clutter in a bathroom, either, and you've added just enough accessories to give the room personality. Well done! I've finally got my bathroom walls painted, but now I'm kind of in limbo until I decide on shelving, etc. It all takes time! It looks great Brenda. And I love your message. Don't postpone life. Enjoy your beautiful new space! i agree with you. we never know what tomorrow will hold or if we will even be here.bathroom looks great. hope all goes well with the walk through. Well done Brenda! I agree, love where you live. I'm slowly making a few changes in my duplex to just make it mine! Love the new vanity, it all look amazing. Great job. My first honest thought was WOW. Looks great. Love that mirror. I love it! Especially the shower curtain! I found things really cheap to do bathroom on Ebay . Builders specials. One suggestion for your light switch is to find a piece of scrapbook paper and modge podge it to your switch plate several coats of modge podge and it's washable. 🙂 I love your blog Brenda. You and I have similar taste in decorating and colors. You are a wonderful writer too. Hi Brenda. I think your bathroom looks fresh and pretty. I like the red, black and white color scheme. The mirror and artwork look really nice. We always have a clock in the bathroom, to help us stay on schedule in the mornings. "Just do what you can" really is the best advice sometimes. I used to worry a lot about some things around the house, but now that I'm older I have to conserve the energy that goes into worrying and use it for other, more important things! your bathroom is just lovely Brenda, I especially like the mirror! Glad you are talking to your son, mine will not even do that. I agree with you also Brenda, life is meant to be lived to the fullest and it is pointless to put off doing or having things that give a person pleasure. Make the place you live right now, more homey. If you don't like something and can change it, do so. Brenda it is beautiful! Nobody needs all those bells and whistles… my bathrooms are also very simple and functional. I need a new vanity in the girl's bathroom as well but I have to get around to painting over the bright orange paint first! Maybe a summer project when I'm off :/ Enjoy your beautiful new bathroom! Good Morning Brenda! Your bathroom turned out wonderful. I don't have a shower in the bathroom, but I have red checked curtains on the window in there. Our shower is in the basement. I like to look at the other blogs, but I am not a fancy dancy gal that wants that stuff either. Loved you reminding all of us to live for the day. You never know what tomorrow will bring our way. Beautiful! 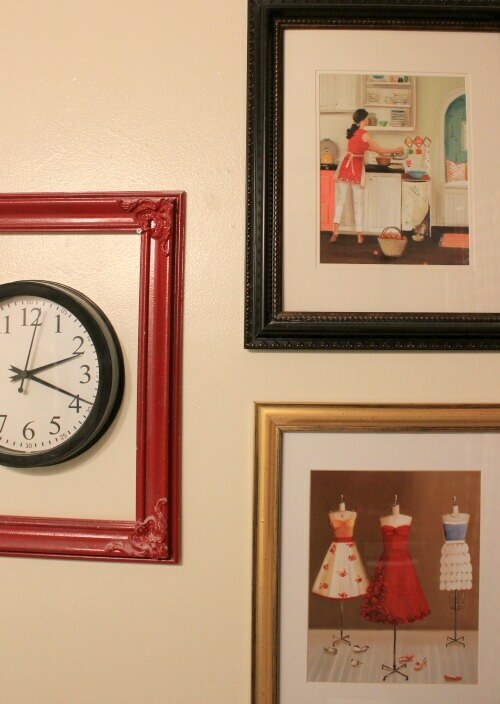 I like a clock in the bathroom too and like the way you have framed yours. I may have to copy your idea. 🙂 Enjoy your new bathroom! Great job, Brenda. Your bathroom is so pretty. Yes, I also love having a clock in the bathroom. Just a thought, when the new owners tour your apartment, just let them know the updates have been tastefully and lovingly added (and paid for) by you. I hope they realize what a good tenant you are. Beautiful. You did a great job. I rent my place also, and I am thinking of fixing up my bathroom too. As always you inspire me. Thanks for sharing. Looks wonderful! Love that mirror above the sink. you did great! it's a wonderful update, but still suits apartment living. LOVE that red check shower curtain! So the walk through is by the potential new owners? Clean and tidy is wonderful but let the shabby show. And push the furniture into positions that make your rooms look smaller. And don't make the patio look too spacious and inviting either. They might be assessing and weighing what rent increases may be possible against the sale price of the complex. Your bathroom is lovely! I'm with you when it comes to "stuff". That mirror just makes the room! Brenda when the new buyers come through ad look at your place they may pay you lol.. I am sure they are going to see some much needed repairs in some of the other apartments, everything looks so clean and up to date just beautiful! That mirror is lovely. Such a find. I also really like the vanity. You did good on that. Just finishing up o e if two bthrms and starting on mine next. I won't even tell you how bad they were. The years flew by with husband sick and we put things aside. Just walking into your precious bthrm would put a smile on my face. Love the bathroom and the message. Good enough is GREAT!!! It's very nice and you did a lovely job of painting. Brenda, I love it! Clean, Simple, and beautiful! I love the colors in your bathroom. I would like to change my bathroom in my rented house. it was built in the 60's and the tiles are pink with tiny slices of light and medium blue running around between the first and second row of blocks. i'm not a pink person, ha ha. I would much prefer your colors. I especially like that shower curtain. I try to jazz up the bathroom with brighter colors of throw rugs. I gave up on getting new shower curtains that didn't improve the place. now I just have a soft flowered one in light blues. I would love to have your bathroom. you really do a good job with everything you change. The bathroom looks great! I have lived in my small 3 bedroom, 1 bath, wood frame house for 43 years. It's not fancy but it is clean and neat and it is my home. I would not change it for anything. I'm proud of you for wanting to improve your living space even if it doesn't belong to you. Once again I say Great Job!! Brenda, I love what you've done in your bathroom. 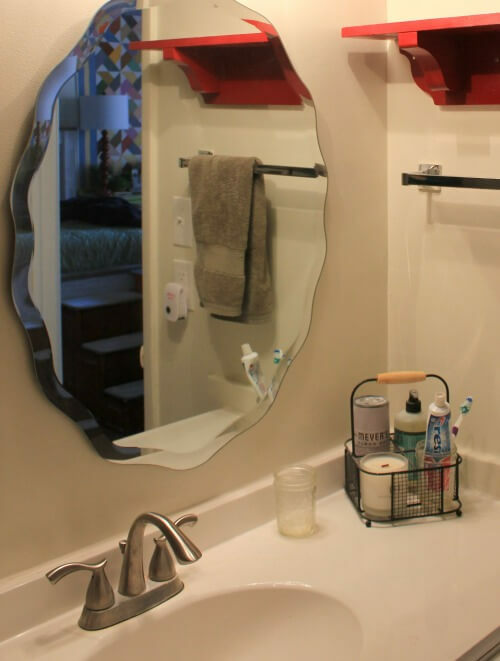 That mirror is like the jewelry for the fresh and clean new vanity. Your bathroom looks fabulous, Brenda. I've always loved red and white. Your message to us all is spot on, too. Very nice! The red & white looks crisp & bright. What an inspiration! Brenda, it looks great. And you did everything for the right reason: for your own satisfaction. I hope the new building owners look at your place and say to themselves that you are the kind of good tenant they want to keep. Way back when, landlords were like that. Let's hope some still are. Beautiful Brenda! I am in love with the shower curtain and the way it plays off the rest of the decor. Enjoy it my friend! So happy for you that your bathroom is done. It came out great, and I love the Red accents. Sometimes I feel when you agonize over something that you want done and there are so many set backs and such, when it's Finally done, …it's like going thru labor, once it's over, all the pain is forgotten and you just enjoy the end results! I hope the new owners don't raise your rent because of improvements. So charming!! 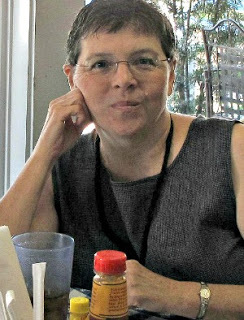 The shower curtain looks exactly like my kitchen curtains and I see that you adore the very talented and whimsical Janet Hill, too. It looks lovely! And your advise – spot on. Absolutely. Grow where you're planted. What a fantastic job! It looks great, Brenda. Your bathroom looks great. Too bad that you had to pay for everything. Here's hoping that the new owners won't raise the rent so much that you will need to move. I know that you are enjoying how it looks. Great job!!!!!! I spy some repurposed living room/dining room curtains now doing duty as a shower curtain. I love that! It reminds me of my LR chairs that I recovered with red and white tablecloths and my dining chairs I did in white with red grainsack tablecloth. You have done a stunning job on the whole apartment and I love seeing what you come up with. i wish I had your "designer eyes". Brenda, I love it! You did a fabulous job! Like you, I love a clock in the bathroom. Everything you chose for this bathroom looks perfect! Love and hugs! Looking good, really really good!!! Very lovely, Brenda! Our bath on our walkout level is red and white with a touch of old-fashioned green (think 1940's). When I ever get it totally finished, I'll share it but no idea when that will be. Yay! I'm so glad you have your pretty new bathroom, Brenda. I love the mirror and the vanity, and especially your artwork and the frame around your clock. Cute! i wonder why you don't stage model apartments. you should! a fun way to make some extra money maybe. but then again… maybe too much hassle? poor Israel. i hope he finds some peace and happiness soon. Such a good message, Brenda. 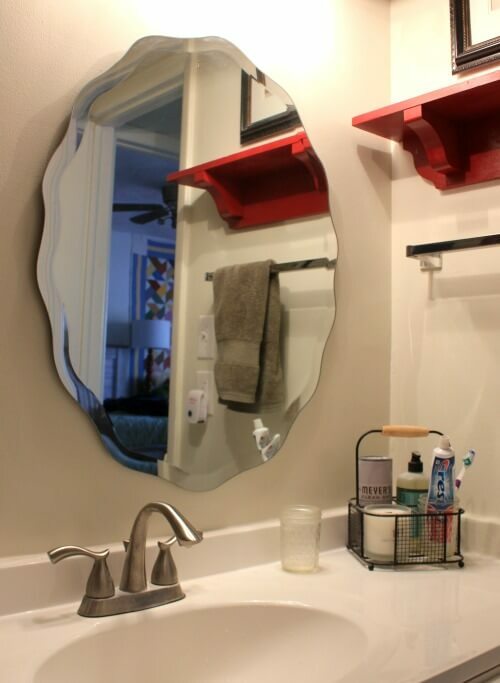 Your bathroom looks amazing and I love all of your touches of red. It makes it so cheerful. And good enough is definitely good enough a lot of the time! I think you did a beautiful job! Clean and tidy. Looks great! It looks GREAT, Brenda!! I love the gingham shower curtain – it makes the space feel so crisp and clean, but with a country touch. Nice job, my friend! Like all your decorating you have done an amazing job. You are so very talented – decorating, gardening, and writing. I am sad that Israel left his wife. You did a beautiful job on your bathroom…looks great! I knew it would be beautiful when you finished, Brenda, and it is. I love the reds, love the artwork. And your advise is so good. Our one bathroom here was so plain when we moved in, and not in a good minimalistic way. We too put in a new and taller toilet but don't want to spend much on improvements in it because we're hoping to add a 3/4s bathroom in the next year and saving for that. So I just started carrying in fun bright things to put on the wall and a plant, etc., including a big clock, and now I think it's a cheerful place, not blogworthy as yours but much better than before. If only I could get my husband to let me put up a pretty shower curtain I found at a thrift shop. There's only a clear shower liner now and he likes being able to see through it. And the curtain is too heavy for the expansion shower rod and would need one that screws in the wall so I'm stymied until I can talk him into it. I'd sacrifice being able to see through the shower curtain in exchange for something pretty, and I bet you would too! Your bathroom turned out so very nice Brenda! I love the shape of the mirror and your bath curtain. The bathroom looks great and you did great improving this bathroom on a budget. I love your bathroom remodel. The red and white is so fresh looking. Great Job.